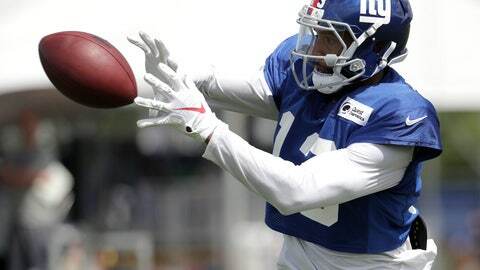 EAST RUTHERFORD, N.J. (AP) — Breaking his left ankle and having his career put in jeopardy has given New York Giants receiver Odell Beckham Jr. a new perspective on life and football. Speaking to reporters here for the first time since getting hurt in a game in early October, Beckham on Saturday was thankful to be back on the field and seemingly more relaxed and more mature. The 25-year-old said he was not worrying about upcoming contract talks, even though he admits he is taking a calculated risk being in training camp coming off an injury and in the final year of his rookie contract. “I literally watched my world turn upside down,” said Beckham, whose ankle snapped in a game against the Los Angeles Chargers on Oct. 8. “I watched relationships close to me devour and things go wrong, and things go sideways. It was a lot of pain that I went through the last 10 months. The 10-month rehabilitation was not only tough, Beckham also had to deal with reports that the Giants were considering trading him and the never-ending social media tweets and video about his life off the field. Beckham called the trade talk rumor and noise that he has now learned to ignore. Beckham’s agent Zeke Sandhu was at the Giants’ workout Thursday and was seen speaking to assistant general manager Kevin Abrams for almost two hours on the patio overlooking the field. Beckham had said he wants to be the highest paid receiver in the game and that has not changed. However, he said he is leaving the contract talks in the hands of his agent and when something happens, it happens. He added if a deal isn’t completed before the start of the season, he would cross that bridge at that time. Antonio Brown of the Pittsburgh Steelers is considered the highest paid receiver, earning an average $17 million on a four-year deal. For now, being back on the field is fun. He is enjoying working with coach Pat Shurmur and said the new offense gives him the opportunity to line up in a lot of different spots. “I love football,” Beckham said. “Football was always an (release) for me, it was always how I could get everything out, and just being able to be back out on the field like I said, I remember waking up 4 (o’clock) in the morning and crawling upstairs to my bed and laughing to myself, like this is going to be a hell of a ride for you to get back to where you’re at. “And now I’m here, and there’s still a lot more for me to do. It’s truly, I’m just thankful; that God is able to put me back out there,” he said. Since being drafted in the first round in 2014, Beckham has played 47 games and has 313 catches for 4,424 yards and 38 touchdowns. The 25-year-old Beckham says his rehabilitation was long and painful. He says there were nights he had to crawl up three flights of stairs to get to his bedroom. The three-time Pro Bowler says he has made significant strides in the past two months is still not 100 percent.